In this issue we highlight nuclear geopolitical concerns of the U.S. and its allies; new legislation in the U.S. and Belgium; civil nuclear developments in the U.S., Turkey, Japan, and India; and updates on the French nuclear security regime and emerging technologies in the U.S. We also recommend several opinion pieces that caught our attention. Since 9/11, the focus of nuclear security has been on eliminating and protecting weapon usable materials to prevent nuclear terrorism. But, as former CIA Deputy Director Michael Morell has noted, while “we were trying to protect the country from terrorists, we became blind to what was going on in the rest of the world.” This also is true of nuclear security. Competition between the U.S., China and Russia is the new global paradigm and this includes fighting for political, economic and diplomatic influence around the world. This geopolitical concept is bigger than the Trump administration - it’s a significant concern of the Pentagon brass and others protecting U.S. global prerogatives. Nuclear security in this context requires that the U.S. and its allies maintain an influential role in supporting and strengthening the nuclear security and non-proliferation rules, recommendations and regimes. But two interrelated trends are eroding this important objective: First, the hollowing out of U.S. nuclear education, expertise and diplomacy; and second, the significantly weakened position of the U.S. nuclear industry at home and as a competitor for international projects. U.S. legal requirements for nuclear supply are designed to prevent proliferation - a national objective that is not true for Russia and China. Yet, Russian reactors are under construction in half a dozen countries, and China will be the world’s largest nuclear fleet operator by mid-century. By then most existing U.S. and Western European reactors will be ready for decommissioning. Both Russia and China clearly see the looming vacuum of nuclear expertise, education, and infrastructure in the West and are positioning themselves to exploit it for their objectives - potentially leading a race to the bottom on security and proliferation standards. The U.S. and its allies need to provide robust leadership to reinforce the nuclear governance system. But that requires clearly recognizing new global realities, strengthening nuclear expertise, and supporting the competitiveness of the civil nuclear industry. Unfortunately, we seem to be blind to this big picture. The Atlantic Council’s report underscores the importance of elevating the strategic nature of nuclear power on the U.S. national security and foreign-policy agendas. 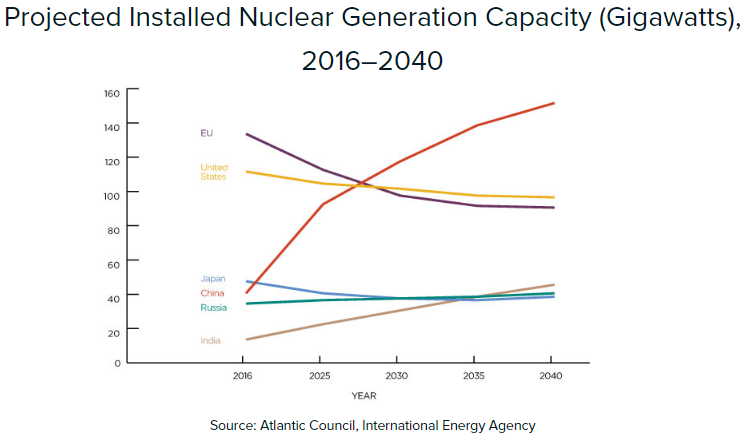 Increasing U.S. nuclear power leadership will advance American commercial interests, boost U.S. energy dominance, and further encourage strong international nuclear safety, non-proliferation and security measures and standards. Emphasis on this issue has increased over the years as Russia and China continue to aggressively advance in nuclear power and expand "their overseas physical presence and their foreign-policy influence in key countries." FirstEnergy Solutions (FES) plans to close its Perry, Davis-Besse and Beaver Valley stations in Ohio and Pennsylvania in the next three years due to market challenges. The plants produce over 4,000 MWe and employ around 2,300 people. Soon after the announcement, FES also sent the Department of Energy (DOE) a request for an emergency order and filed for bankruptcy. Both, President Trump and DOE are reviewing the request. The New Jersey Senate and Assembly will vote on Senate Bill 2313 and Assembly Bill 3724 today. The bills will provide a $300 million annual subsidy rescue package to Public Service Electric and Gas. Also, Minnesota lawmakers are considering Senate Bill 3504, which would designate Xcel Energy’s MN nuclear power plants (NPP) as carbon reduction facilities and grant the company approval for nuclear facility cost recovery. Belgium approved a new energy strategy that will remove nuclear from its energy mix between 2022-2025. A final decision will be made in July. NuScale's small modular reactor could be developed within the next eight years if the company procures $120 million in equity investment to accelerate the process. This would be the world's first small-scale nuclear power reactor that is cheaper to build and capable to back up wind and solar power. Last week, Rosatom secured the construction license and began working on the first unit of the Turkish NPP. The Akkuyu plant, a $20 billion project of a four-unit 4,800 MWe plant, forms part of Erdogan’s “2023 Vision” and is expected to meet 10% of Turkey’s electricity needs. Russia was awarded the contract in 2010 with 2030 as the start-up date, and is currently searching for local partners to invest on 49% of the project by 2019. If unable to find partners, Russia-owned company Akkuyu Nuclear will finish constructing the NPP. Side Note: A recent poll indicated that 74% of Russian citizens want the government to maintain and continue developing the nuclear energy industry. A recent report by a Japanese advisory panel recommended Japan's Ministry of Economy, Trade and Industry to accelerate the development of renewable energy and continue to lower the country's dependence on nuclear power. However, the report listed nuclear power as an option for decarbonization in 2050. Also, Shikoku Electric Power Co. President Hayato Saeki announced last month his company’s plans to decommission the Ikata 2 NPP due to financial reasons. Narendra Modi’s government cut its nuclear power capacity target of 63,000 MWe to 22,480 MWe by 2031. A new U.S. DOE project would allow for the remote monitoring of nuclear reactors from a 25 km distance, facilitating efforts to track the production of fissile materials and verify non-proliferation agreements. Short commentary by PGS President Kenneth Luongo, " Nuclear Power and Global Security."